The client had just bought the church and has a strict time scale for opening. 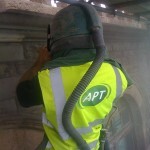 The mobile soda blast cleaning teams were asked to carry out several aspects of the project including stone stone restoration and roof repairs. 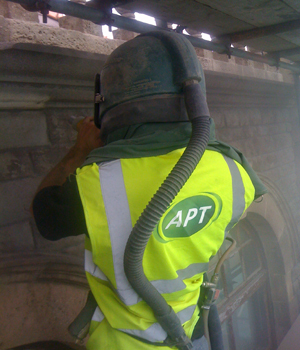 Soda blasting all the external surfaces to clean the sandstone and cut stone surfaces , soda blasting the internal timbers and vanished wooden ceilings and wall panelling to remove the aged paint and varnish coatings . We endured the worst weather for many years which caused huge changes to the works programme, with lots of the works being completed outside and up to almost 30 meters in height. There were many safety factors to take care of when lifting and working on the platforms. The internal works had to be carried out from manual towers, only after it was discovered that the floor could not support the use of any machined or powered access lifts. To add to the workload, there were roof tie bars spanning the main room where we needed to access the ceiling, which meant having to dismantle and erect the cleaning towers on a daily basis. The clients architects drew up a tight works programme and we agreed to clean off and remove several layers of vanish and paint from soft wood surfaces. We liaised with the local authority’s conservation architect to approve the works programme. We used the mobile soda blast cleaning method with fan type nozzles at pressures of 2 bars to remove the surface vanish and other coatings from the ceilings and wall, to the client’s desired finish. To remove graffiti from the stone and engineered face brick to achieve the desired finish, we administered a pollutant using both hot box doff cleaning and wet soda blast cleaning using a Vortex II Blast Head and just 1.5 bar air pressure. You can read more about our floor preparation service by clicking here.